A Silicon-controlled rectifier is the four-layer solid state semiconductor device used to control current. The term SCR is the trade name of General Electrics. SCR is used in switching circuits and in the normal Off state, it will not pass current. When the Gate – to Cathode current exceeds a particular threshold level, SCR conducts. Once conducted, the SCR remains in the On state (Latched) even if the gate voltage is removed. This On state continues until the current flowing through it reduces below the holding current. If the Anode current drops, SCR will switch Off immediately. The SCR has three junctions used for switching and like a diode; it conducts in only one direction. That is from Anode to Cathode. Basically the SCR has four PNPN layers forming the three junctions and the pins are connected to these junctions. A very small current in the Gate of SCR can allow very large load current to flow through it. Generally SCR is used to control DC circuits and it can be also used to control AC loads but the SCR is capable of operating on only one alternation of each input AC cycle. The SCR can conduct only on those alternations which make its anode positive with respect to its cathode. The device will turn off as soon as the input ac voltage drops to zero and starts increasing in the direction which causes the SCR’s anode to be negative with respect to its cathode. However, other circuit arrangements can be used which will allow full ac power to be applied to the load. This is often accomplished by first rectifying the ac input signal so that both alternations of each input cycle will properly bias the SCR into conduction. Through this method, the positive and negative alternations of each cycle are converted to all positive or all negative alternations and so that they become a pulsating dc current. Triac is the trade name of the semiconductor device used in power control and switching applications. Unlike SCR, Triac can pass AC in both directions once triggered thus acting as a bidirectional device. 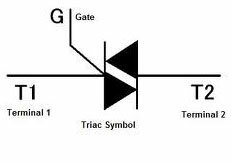 Another important property of Triac is that, its gate can be triggered by giving either positive or negative current. In order to create a triggering current, a positive or negative voltage has to be applied to the gate with respect to the MT1 terminal (A1).Once triggered, Triac will conduct continuously until the current drops below the holding current. Another advantage of the Triac is that the load current can be controlled through changing the phase angle of the triggering pulse to its gate. This feature is used in lamp dimmers and speed controllers. The Electronic Fan regulator uses Triac to control the voltage through the Fan. This is achieved by the shifting of the phase angle of pulse applied to the gate terminal of the Triac by the rotation of the variable resistor Knob. Triac is equivalent to two silicon controlled rectifiers joined in inverse parallel (but with polarity reversed) with their gates connected together. 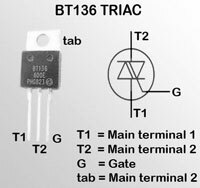 Like SCR, Triac is also a three terminal device. The MT1 and MT2 (Main Terminals 1 and 2) terminals are used to pass current in either direction while the third terminal G ( gate ) is used to send trigger pulse to the device. When the voltage on the MT2 terminal is positive with respect to MT2 and a positive voltage is applied to the gate, the ‘Left SCR’ in the Triac conducts. If the voltage is reversed and a negative voltage is applied to the gate, the’ Right SCR’ conducts. Minimum holding current ‘Ih’ must be maintained to keep the Triac conducting. AC or DC pulses can trigger Triac and four modes of triggering are possible. Diac or Diode for ac is bidirectional device used for triggering SCR and Triac. Diac remains non conducting until its breakdown voltage attains. At this point, the Diac remains fully conducting and remains on until the applied voltage is reduced below its holding value. When connected to the voltage source with a current limiting resistor, it behaves like a High Impedance till the applied voltage rises to 35 volts. At this point, the Diac act like a Zener diode and conducts. At the Avalanche state, the Diac shows Negative dynamic resistance and the voltage across is snaps back typically about 5 volts, which is sufficient to trigger a Triac or SCR. When the voltage drops to 30 volts (typical holding voltage), the Diac will turns off. This behaviour of Diac is bidirectional and same for both directions of current. This is similar to the glowing of a Neon lamp. Diac has no gate and has only two terminals like a diode. The terminals are A1 and A2. 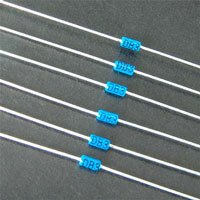 The most common Diac used in power control systems is DB3 .Its image is shown above.